The Pricing Masterclasses 2007 were mentioned in the 'MyCareer' supplement in The Age today, Saturday 31st March 2007. You can see what they said, in page 4 'Networking' column, below. Sales of the Melbourne event are very strong: early bookings are strongly recommended. Are low cost airlines running out of names? Click here to see the name of the latest low-cost airline, who plan to start flying to destinations in France, Germany, Italy, Spain & Eastern Europe, from Cardiff International Airport this coming (northern) Autumn. 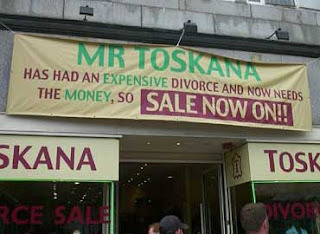 Any excuse for a sale. Need I say more? Can advertising save phone booths? Telstra recently announced that it will offer advertising space on telephone booths. This may save thousands of telephone booths around the country apparently, which are suffering from declining usage due to the proliferation of mobile phones. Will advertisers pay to advertise inside phone booths if no one is using them? Probably not. If no one is using them, are people looking for them and therefore at them? The answer once again is probably not. Telstra says that phone booth advertising has an 80% recall rate. Maybe thats the novelty factor of people saying "Wow, look at that, a phone booth. I wonder who uses that these days?" What else could Telstra do? Well, perhaps phone booths could become mobile phone recharging stations. After all, mobile phones are not totally wireless: they still need to be recharged. A five minute power recharge station could be one option for phone booths. Another may be a pre-paid credit vending machine, allowing users on pre-pay plans to quickly grab an extra $20 credit from a vending maching inside the booth. Credit on other Telco's could also be offered in-booth. These two services could even be combined in the one booth...and I'm sure people would then read in-booth advertising while charging their phones for 5 minutes. Readers of this blog who have attended one of my pricing workshops will know that I use Zara (whose Kuala Lumper store is shown opposite) as an example of a best pricing practice company. This article, from the BBC wesbite (once again, courtest of Alan Cooper at Managing Change, tells how H&M, is responding (and looking increasingly like) Zara.